Is the Amazonian Manatee a lady or an ox? Her name comes from a Brazilian Indian word that means “Lady of the Water.” There has even been speculation that early explorers mistook the Manatee for a mermaid. Not all native Brazilian Indians think of her so graciously. 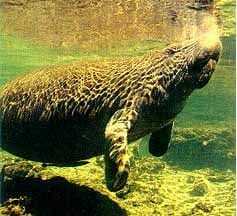 She is also referred to by some as the Amazon Ox Manatee. Whether an ox or a lady, the Amazonian Manatee is large, but is the smallest species of Manatees. Amazionian Manatees can be found in the fresh waters of the Amazon River Basin throughout Brazil, Columbia, Peru and Ecuador. It can also be found in the Black Water Lakes of the Amazon Valley. Unlike its cousins, the Amazonian Manatee cannot survive in salt water. West Indian and West African manatees have much rougher skin than the Amazonian Manatee, but they share the same gray color. The Amazonian Manatee sports a white or pinkish colored belly. Little hairs cover its body, and its face is tipped with coarse whiskery hairs. This species’ paddle-shaped tails and two pectoral flippers give it great swimming skills. The largest of this species measures from eight to ten meters in length. The Amazonian Manatee favors the aquatic vegetation floating along the top of the water. This feeding habit is unique to this group. While Amazonian Manatees float along the top of the water feeding, its cousins find deeper water more to their liking. It appears that Amazonian Manatees mate throughout the year, but most often the female gives birth to one calf during the rainy season when the rivers begin flooding. Few funds are available for the study of the Amazonian Manatee in Brazil. More studies have been conducted in Ecuador, Columbia and Peru, but much more research is needed. Jaguars and sharks hunt this species, but human hunting has been banned since 1973. Not all of its trouble stems from hunting. Human attempts to control water flow and flooding have damaged their food source, causing a great drop in the number of living Amazonian Manatees.